One thing you immediately notice in Okinawa is there are vending machines EVERYWHERE. You can be on some small street in the middle of a residential neighborhood and you'll be able to find a vending machine on the side of the street. Another point of interest is many of the vending machines serve both hot and cold drinks. So, you can get a hot can of coffee or a cold can of iced coffee from the same machine. 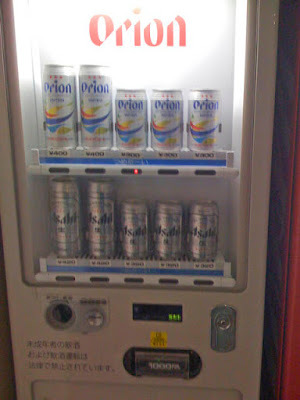 And here's something I'm pretty sure you'd never find in the US - you can get beer from some vending machines!